The World Biogas Association (WBA) has this week been accepted as a new Actor under the Agriculture and Waste Initiatives of the United Nations Environment Programme’s Climate & Clean Air Coalition (CCAC). The CCAC’s partners and participants work in cooperation with key emitters of short-lived climate pollutants and other stakeholders around the world to encourage, enable and catalyse action to reduce greenhouse gas emissions. Biogas technologies reduce methane emissions through capturing emissions from organic wastes such as food waste, sewage, and agricultural wastes in anaerobic digesters, which recycle the wastes into renewable energy, clean transport fuel, and nutrient-rich biofertiliser. WBA, which was founded in November 2016 at COP22 in Marrakech, recently launched a new report, Global Food Waste Management: An Implementation Guide For Cities, written in collaboration with C40 Cities. Amongst other topics, the report explores how cities around the world can reduce methane emissions through separately collecting food waste and recycling it using biogas technologies into valuable green products. 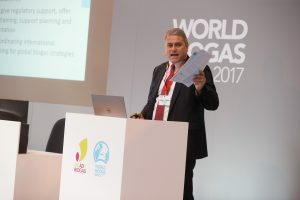 WBA will be holding the UK launch of the report at UK AD & World Biogas Expo 2018, the world’s largest tradeshow dedicated solely to AD and biogas, which it is organising in partnership with the UK Anaerobic Digestion & Bioresources Association. The expo will feature dedicated workshops and panel discussions on reducing methane emissions from organic wastes, as well as an awards ceremony celebrating the most innovative biogas projects from around the world.